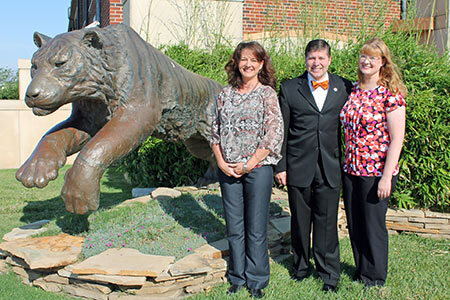 Hoping to impact the lives of future college students, Cowley College president Dr. Dennis C. Rittle and his wife, Christy, made their final contribution to establish an Endowed Scholarship which will begin being offered in the fall of 2016 for a full-time student majoring in an educational field of study. The scholarship honors Christy’s parents, Jim and Verna Zang, for their tireless commitment to support education. The scholarship will be awarded to a student majoring in the field of education, in particular teacher education, but can include students majoring in early childhood development. The recipient must have at least a 2.5 cumulative grade point average. Julie Rhoads, Cowley College Director of Education, said attending a community college offers access to an advanced education at a relatively affordable budget, however even the cost of a community college can pose a financial challenge for some. Jim and Verna both earned degrees in education, while Verna and Jim’s mother, Viva Zang, and sister, Joy Leatherman, are retired educators. Christy is a teacher at the Arkansas City Middle School, while her sister, Sara Grove, teaches preschool in El Dorado. Their cousin, Kathi Leatherman, is a teacher in the Wichita Public School District. “We saw the joy Jim and Verna had by being involved in education,” Dr. Rittle said. “The service of Jim and Verna inspired us to endow a scholarship so that future educators may share in the same joys we experience while serving in this profession. We were recipients of scholarships during our educational journey. This scholarship is an opportunity for us to bless others,” Dr. and Mrs. Rittle shared. This scholarship honors the Zang’s investment into their daughter Christy, a third generation educator, and, equally, their investment into their son-in-law, Dr. Dennis C. Rittle, who is a first generation educator.